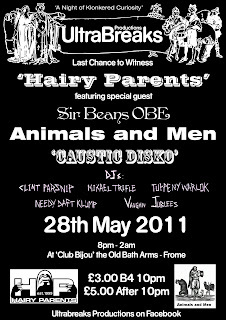 Continuing the solid start to 2011 we're back with our BIGGEST jam yet, and a night that promises to be packed with mad twists-and-turns at what is fast becoming known as the HEAVIEST social night out in Frome, there's a LOT to get through here so i'll crack on..
Tonights very special guests are the magnificent HAIRY PARENTS. This LEGENDARY WEST-COUNTRY HIP HOP collective have consistantly been masters of their craft for years, ( local b-boys of advancing years may recognise this crew from previous incarnations as TRANSCRIPT CARRIERS, PARLOUR TALK, UNDIVIDED ATTENTION and ALL CREATURES) with an top drawer back catalogue including the highly acclaimed PARLOUR TALK album 'Padlocked Tonic' which is considered by many in the industry to be one of the BEST UK HIP HOP ALBUMS EVER.. If that wasn't enough, we're also honoured to present Fromes original minimalist post punk band ANIMALS AND MEN, who recorded some classic singles in the early eighties that were distributed by Rough Trade, and picked up positive reviews in NME. With a heavy and sparse garage soundscape not too dissimilar to an early Velvet Underground (in my humble opinion!) or in the bands own words "Somerset post punk pioneers and d-i-y - from the early 80s and now " A&M are hailed as an influence on many of todays post punk bands, they're now back with new material and are on their final UK stop before flying out to San Francisco to play a series of stateside gigs ... it promises to be explosive! Our triple-point of madness concludes in Room 2 where the CAUSTIC DISKO DJ muties CLINT PARSNIP, MIKAEL TRIFLE, TUPPENY WARLOK and NEEDY DAFT KLUMP will be dumfounding the finest dancers in town with their klonked out brand of crate digging obscurities, old skool funk, charity shop bargains and left field psych oddities, plus the added attraction of our 'King of the telly's' VAUGHN JUBLEES and his bonkers visuals set-up, we reckon it's the perfect sideshow distraction. 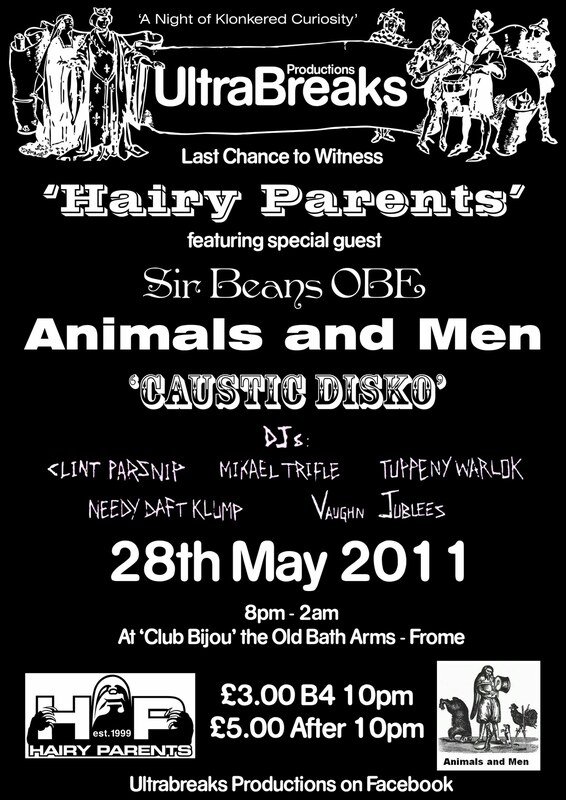 This line up 's a serious coup for the town so miss this and it's gone people, time to represent! We're expecting this Jam to be packed out (and rightly so!) so get on down there early to make sure you get in, and save a few bob.